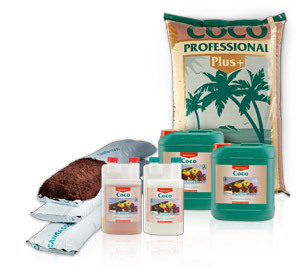 Why does COCO need special nutrients? Because CANNA COCO is 100% organic it has a relatively high Cation-Exchange Capacity (CEC). This means the substrate has the ability to hold and retain certain nutrients vigorously thus requiring these nutrients to be supplied in a special form that remains available to the plant. Due to the special coco charac­teristics in combination with the unique pre-buffering process, it is possible to combine vegetative and flowering nutrients in one nutrient mix. The medium and the plant itself control which nutrients are released to the plant at just the right times. This means the grower doesn’t have to worry about the proper point to convert from grow to bloom nutrients! CANNA COCO is a two-part nutrient; hence there is an A&B version. This is essential because the concentration and forms of the nutrients supplied interact with each other in the concentrated form. This interaction can cause non-recoverable preci­pitates and an overall change in those specialised coco forms of the nutrients. CANNA COCO allows the cultivator to include the exact quantities of nutrients in the growth and blooming phases of fast growing plants. Other CANNA products, such as RHIZOTONIC (e.g. root development, stress relief), CANNAZYM (e.g. healthy root environment) and PK 13-14 (e.g. stimulating flowering) give additional support during various specific phases of the plant’s development. Combined with these CANNA products, the plant can optimally focus on growing and blooming, guaranteeing high yields.